Newt Gingrich owes African-Americans an apology. He absolutely knows what he is doing. His constant calling President Obama “the food stamp president” is nothing more than racial politics, no less reprehensible or excusable than when Lee Atwater and the GOP used the image of Willie Horton to take down Michael Dukakis in 1988. Gingrich has settled into the language that “liberals” or “elite liberals” are the only ones who “despise making money.” That is incorrect, but it isn’t a morally and ethically reprehensible statement or behavior. But going to South Carolina and using language that feeds into the racial fears and misconceptions that come up in conversations with far too many white people, is a moral and ethical outrage. Can you not get the votes, Mr. Gingrich, without putting black people down and feeding into the misconceptions of way too many white people? Statistics released by the United States Department of Agriculture show that 35 percent of all food stamp recipients are white, compared to 22 percent black, and 10 percent Hispanic. If you, Mr. Gingrich, would say that, or something to that effect, the insult you have heaped upon the descendants of African slaves who built this country would be non-existent. I wonder if Gingrich, or any candidate, has the chutzpah to tell people part of the reason that the unemployment rate amongst black men, especially young black men, is that too many white employers still refuse to hire them? 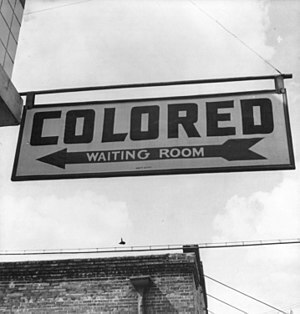 I wonder if Gingrich, a historian, has the courage to talk about the fact that black people have lived through an era where at one time, there were blatant signs put up, “Black (or Colored) people need not apply,” as African-Americans sought to find work? The signs are gone, but the emotions, feelings and beliefs that made people feel justified in putting such signs up are far from being gone. I wonder if Gingrich has the courage to stand up and say, since he is wanting to be president of ALL of the people of this nation, that the undercurrent racism of this country will be met with and dealt with in his administration if he is elected president, so that the course of this nation will be turned, finally, away from post-Civil War and Reconstruction white resentment of black people which has never died, to a 21st century, Christian endeavor to deal with our racism honestly, for the good of the nation. Many, too many, white people say, and believe, that “this is a white man’s country.” In her book Rising Sun, author Sharon Davies gives an account of a young white girl who is appearing before a grand jury because she has converted to Catholicism, against the wishes of her parents. In the 1920s, the Ku Klux Klan was not only against black people and Jewish people, but it also hated Catholics. This young girl’s parents were amongst the Catholic-haters, and, enraged that his daughter had married a Catholic boy in secret, her father had shot and killed the priest who married them. A young Hugo Black, who would become a member of the United States Supreme Court, was one of the girl’s defense attorneys …and he was also a member of the Klan, as were many of the jurors. That feeling has not gone away and Newt knows it, and he thus knows that saying President Obama is “the food stamp president” feeds right into that belief and the sentiment that there is a need to “take the country” back. The charge is that Mr. Obama is the most liberal president in history. Say that. True or not, it’s fair. It is fair political rhetoric. Say that it is true that more people are on food stamps than at any other time in our history, but that statistics say that more white than black people are on those food stamps, and they needed to do it because the economic mess that Mr. Obama inherited from the GOP was so horrible that had he not made a way for more people to get food stamps, a lot of Americans, black, white and brown, would have not been able to eat! Make the argument against President Obama openly about economics, and not sneakily about race. Americans who have found themselves not only using but needing food stamps for the first time in their lives are ashamed for having to use them, but at the same time are grateful that this president did what he thought would best help them. It is true that some people, black and white, who receive government assistance, are abusing the system. Say that, Mr. Gingrich, and nobody will be able to accuse you of playing the race card or indulging in racial politics. When you say that President Obama is “the food stamp president,” say that his policies have resulted in more black and white and brown people getting food stamps than ever before. Then your statement will not be racially charged and racially polarizing. I know that politics, or the game of politics, is not supposed to be fair, but it is high time that racial politics stop being the trump card for politicians reaching for the White House. African-Americans, and indeed all Americans, deserve better. African-Americans have provided the labor upon which the economy of this nation was built. It is high time white politicians say that out loud, and stop the craziness and stop using words that only make the decay in our nation caused by racism worse. You, Mr. Gingrich, owe African-Americans an apology. It is NOT all right to insult us, even if you are trying to kick Mitt Romney out of contention for the presidency. What you are saying and are now defending, is morally and ethically wrong. We deserve better. Comments like “Obama is the food stamp” president are not only ridiculous but really unfounded. The republicans seems to conveniently forget the state that the country was in when Obama became president. They seem to forget that their buddy George “Dubya” Bush was largely responsible for it. Newt Gingrich doesn’t care about the real statistics, he only cares about making Obama look bad. And he also doesn’t care about black people, because he knows that black people aren’t going to be the ones who put him in office. So he feels (as well as Mit Romney) that he can make comments that are definitely racist and demeaning. He only cares about the rich white people who are keeping him where he is. He should apologize, but he never will. You are right. Gingrich will never apologize. It would make him appear to be “weak” in the eyes of his followers. Most people do not know that only the strong can admit wrong or mistakes.